Marcia Smilack 19 janvier 2013 13 décembre 2016 Volume 11, Automne 2012. Neurosciences, arts et littérature. 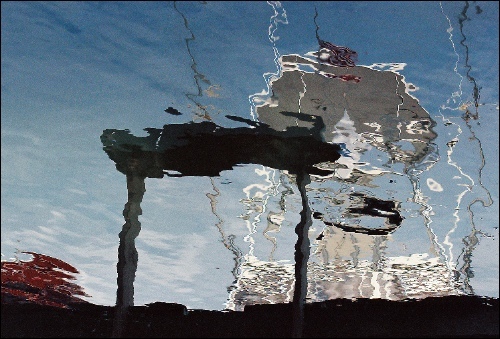 In « The Language of Synesthesia,” Marcia Smilack tells the story of her life as a fine art photographer who taught herself how to use a camera by relying on her synesthetic responses as signals for when to click the shutter. 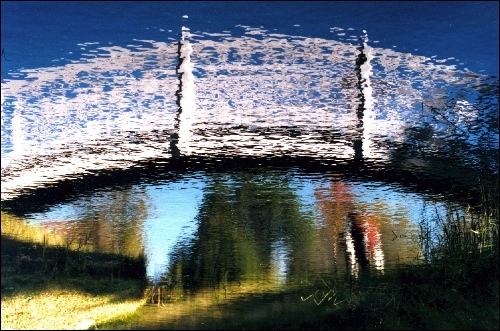 Photographing reflections on moving water, she created a career in which named herself a Reflectionist and named her images paintings by camera. The responses that tell her to take a picture include sound and texture elicited by what she sees. In detailing her history, she tells of the seminal experience at age six when she struck a piano note for the first time and instantly saw the color green; the musical sound elicited color. Later in her life, she became aware that her synesthesia worked in reverse as well. That is, looking at color and shape elicits sound and texture. She hears with her eyes and sees with her ears. She explains that from the first « green note” of her childhood, a room was carved out in her mind where all subsequent synesthetic experiences are viewed on an internal screen. It is the same room where her eidetic memories are preserved in present time. She lives her life in metaphor and describes the double life created by her synesthesia. That synesthesia is itself a language is obvious to her, which she shows with several examples from her artwork where the symbols of her photographs serve as musical nomenclature. The picture language that her body produces made of colors and shapes provide a natural metaphor to the words that come to her secondarily as a translation of what she sees. She calls her synesthetic picture language her native tongue and shows the relationship between her waking synesthesia and the synesthesia of her dreams, posing the question of whether synesthesia might be a waking form of dreaming. I was six years old the day a long furniture truck pulled into our driveway to deliver our piano. I can still taste the hot chicken noodle soup I was eating that winter afternoon as I listened to the two moving men roll the piano into our house and install it. The moment they were finished, I raced into the living room where I beheld my family’s new acquisition: an upright piano made of blond wood polished to a sheen that was matched in brightness by its ivory keys. Impulsively, I reached out and touched a random white note when to my utter astonishment, an image appeared outside my face, a few inches above my eyes that arrived so quickly it startled me into a state of wonder. What I saw was green but not just any green. It was the green of shimmering light within the loose confines of a rectangle that had diffuse edges. And while the vision vanished almost as quickly as it arrived, I never forgot it. It disappeared at exactly the moment the sound receded from the room but not from my memory. Indeed, I consider it a seminal experience of my life and the start of my synesthetic experience though of course at the time I had no words to describe it at all, not even to describe what shade of green I saw that day – a green I have really never seen in the external world. It is neither the color of green pigment nor the color of the natural world. Even so, a few years ago — almost half a century after this experience of seeing my first “green note” – I took a reflection image that captured what Nature could not do alone. When I looked at the image later, I recognized the shimmering green from that first experience and thus named the image “Green Note” (see image). Most astonishing was how quickly the image got there, faster than I could comprehend that I had even heard the sound that produced the vision which tells me two things: one, that pictures travel faster than words, and two, that my body has its own language, one that predates knowing of any kind. This what happened: I struck a piano key, it made a sound, and my body responded by sending me an image to my mind. I cannot say that my body intended for me to find meaning in the message, but maybe that is what consciousness is all about — finding meaning in the message. When I recall the image today, I think of the green light as a picture of qualia that is the essence of experience or the part that cannot be translated into words but which is essential to its meaning while the rectangle represents the logic of my mind’s attempt to understand and express it in the language of consciousness. One might ask what happens to the child the first time he or she has such an experience? I sometimes think that when people ask about synesthesia, the better question to ask might be not what a synesthete sees, but rather where the synesthete sees it; for clearly, I did not see the green note with my “outer” eyes or the external eyes we all have in order to view the world outside our bodies. I see the visions on an internal screen within my mind, that I saw for the first time the moment I saw the sound of the green note. I believe a room is carved out in the mind of the child synesthete at the exact moment of earliest revelation, in my case my first green note, which I saw in a room on an internal screen where I subsequently saw and see all my synesthetic experiences. What kind of screen? I imagine it is similar to the screens on which we all see our dreams – totally real for the viewer if unseen by anyone else. It is the room that serves as a pantheon for the long-remembered events of the synesthetic life of a person with an eidetic memory such as myself; a room that is a permanent repository for my eidetic memories that are preserved in the pristine clarity of present time explaining why those memories remain as fresh and unchanging in sensory detail throughout my life, as present in the re-experience of them as at the time they originated. Moreover, I believe that from that moment I began a double life, an undetected life (to others) for I live my life in metaphor, constantly accompanied by the friendly doppelganger of the same age whom I have always known, who speaks in a language that predates knowing of any kind: a language made of shapes and colors that function just like words but which travel faster; a language that provides the foundation of my eidetic memories by automatically double coding whatever happens to me in my picture language. It is my second self who serves as navigator, the one able to spot synesthetic events faster than I could notice them if I tried, but then that is the whole point, that there is no use in my trying, since the deepest revelations come to me when I am not looking for them. My only job is to allow my unseen yet all-seeing inner self inform me of what is true and believe what I am told. I taught myself to use a camera when I was nearly forty years old. During the previous decade, and indeed in the years leading up to it, my creative and intellectual life had always been focused on words. A compulsive reader since early childhood, I got a PhD in English Literature during and after which I taught college for several years. But because there were no tenure-track jobs available, I also began to work as a freelance journalist for newspapers and magazines and was slowly switching over from teaching to writing. I took a break from teaching to begin work on a serious book about the Vietnam War, which turned out to be a dangerously depressing subject for me. By chance, I also acquired a camera the first summer of this new endeavor, expecting to use it only for fun when I took breaks from the painful hours I spent researching and writing my subject. Gradually I found that taking photographs became serious for me as well as it solved an emotional problem I had hardly realized I had; but the truth is that writing had become increasingly more painful for me to do whereas taking photographs, particularly of reflections on water, buoyed my spirits and gave me a new outlet for the creativity that had previously expressed itself through words. It is fair to say that I became a serious photographer because I had lost my tongue: I could not write anymore – not naturally or automatically or easily as I had written all of my life – yet needed to communicate. As a result I invented a new language for myself in the reflection photographs I began to take exclusively. I taught myself photography by relying on my synesthetic responses to what I see. 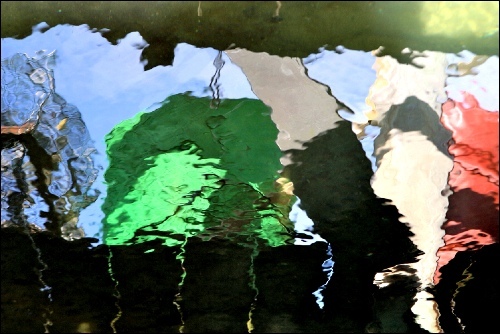 I knew nothing about photography at the time; I had no training in either photography or visual art, but I was living on the water in a small fishing village and had noticed that when I looked at reflections on water, I heard sound, the reverse of my original “green note” on the piano. Relying entirely on intuition, I decided to trust what I “hear” in my mind’s eye as reliable signals that pointed out my decisive moments. I began to photograph reflections exclusively and soon after, named myself a Reflectionist. I named the images I create in this way “paintings by camera” because the process always felt more like painting than photography, largely because of my collaboration with Nature. I photograph subjects that are never hidden but often unseen. I use the surface of the water for a canvas, I rely on wind for my brushes and I let the time of year and the setting provide my palette. I do not ever manipulate the water to achieve my effects because the challenge for me is to discover what Nature already provides whereas manipulating the water would take away the element of discovery and in turn make the art go away. I walk along the edge of the water and look straight ahead; I do not look at the water directly. I walk until something in my peripheral vision makes me turn around as one does at the unexpected sound of a siren, though in my case, it is a siren no one else happens to hear. As soon as this happens, I stop, then step back, and walk into the moment a second time; then, when I feel the impulse to turn around to see what just called me, I walk toward the source of my distraction. Once there, I put my camera to my eye but choose not to focus. I prefer at this juncture to look toward my subject with blurry vision. I know to click the shutter when what I am looking at produces sound, a sensation of motion or the feeling of texture against my skin, although it has nothing to do with “knowing” in the usual sense. Rather it is an intuitive knowing, a felt awareness brought to my attention by my synesthetic responses which I think of as messengers that arrive faster than thought to deliver a single message I always heed: beauty is lurking. I do not always know what my images look like when I take them because I am seeing my subjects upside-down. It is an odd and difficult task to compose upside-down; I found that eventually it is simply easier to give in and rely on other parts of my mind to composition. By relying on feelings in this way, I cannot help but project internal states onto what I see. My eyes function like emotional periscopes that pull up data that gets read on the outside. I leave my thoughts in the car when I take pictures because if I have even a remote thought, I lose the necessary connection to what I feel in relation to what I see. In that sense, my photographs document my emotional life that I believe explains the reason others have strong emotional reactions to my images. Just as the water provides a mirror for my feelings, so I believe my images provide a mirror for the feelings of the viewers who project their emotions onto the images just as I project mine onto the reflections on water. The night I took the photograph “Cello Music” (see image) which is one of my earliest reflective photographs, I did not intend to photograph a reflection. In fact, nothing could have been further from my mind. I had just begun to experiment with a camera and as I had no training or knowledge of how cameras worked, I assumed that I should be trying to take pictures as I had seen other people do which is to say that I should take pictures of subjects above not below sea level which is what I was trying to do this night. As I walked along the edge of the harbor in the little fishing village where I lived something odd happened to me. I became aware of the sound of cello music though as I looked around it was immediately clear that no one but I had heard it which reminded me of synesthesia about which I knew little except that I had been told I had it and that synesthesia was responsible for why the first note I played on the piano was green. I briefly wondered if this experience where only I could hear a sound could be related to my synesthesia but realized it was similar but in reverse for whereas my first green note was an image I saw as a result of the sound I heard when I struck a piano key, in this case I heard a sound which was elicited by something I had seen. And while I thought that the two experiences seemed alike enough to pose the question, I did not learn for many years that my hunch was correct or that there is a name for such dual experience called “bi-directional synesthesia” which explains why I both see with my ears and hear with my eyes. On this night, however, I was merely curious about the source of the cello sound and decided to retrace my steps to solve the mystery. I had not been looking directly at the water when I heard the sound initially so in recreating the experience, I walked past the location looking straight ahead, keeping the water in my peripheral vision on my right as I had before. However, this time when I heard the sound of cello, I immediately stopped and walked toward the water where the sound was produced. The setting sun had turned the skin of the sea to a golden hue on top of which I watched parallel straight lines break up and bend with the motion of the lapping sea. In actuality, the lines were a reflection of a tall mast on a faraway sailboat but I didn’t figure that out until later in the evening. At this moment, I let myself become entranced by watching the bending lines whereupon I began to feel satin against my skin. When I felt that I was climbing into the shadows between the waves – shadows that incidentally were also echoes I heard – I clicked the shutter. By the way, I hear cello each time I look at the image today and discovered quite by accident that when I turn the image upside-down, I hear violin. This image showed up in a dream several years after I took it. In the dream the image appeared as it felt the night I took the picture, as cloth or the satin fabric of a dress that was flung on a nearby chair, which I observed in peripheral vision on my left. In the dream, I was playing the dress on the piano, that is, using the seams of the dress as my written music, which worked beautifully, provided I did not look at the dress directly. As long as I viewed the dress peripherally, those bent and broken dark lines floating on the gold surface of the fabric were perfect symbols of written music that I could read as if the chair that held the dress was a makeshift music stand. I could easily play the lines, which were also the seams of the dress, and I was able to bring the dimensions of color and texture of the dress in my interpretation of the music as well. However, this only worked in peripheral vision, for as soon as I turned my head to look at the dress directly, I lost my power and the “written music” turned back into being only a dress. Yet seen peripherally, the bent black lines of the original image, which became the seams of a dress, were easily used as the lines of music that I was able to sight read on the piano. When I awoke, I thought about the importance of peripheral vision both in the dream and in my creative life in general since it is peripherally, after all, where I most often find my subjects for my reflective photographs or rather where my subjects often find me since they turn out to be whatever it is that captures my attention in peripheral vision; I discover my subjects when I investigate the source of my distraction. This made me wonder about synesthesia as it functions in my perceptual life. I wondered if in order for synesthesia to take place it might necessary for me to not become overly focused? If so, how ironic that a person must be in a partial state of unawareness in order to become the most aware. I also wondered if synesthesia could be a waking form of dreaming? Of one thing I felt certain which is that the main difference between a non-synesthete and a synesthete is that the bearing wall that partitions off the unconscious from the conscious in the experience of a non-synesthete is no more than a permeable curtain in mine, a sheath through which I am able to travel easily back and forth between consciousness and unconsciousness awake or dreaming. Then I wondered if the real difference between us might merely be a thin layer of unawareness? I think of consciousness as very layered and believe my synesthesia allows me to lift up and see through perceptual layers giving me access to more layers of consciousness than are available to most people. I also believe that becoming aware of one’s synesthesia in the initial experience like my first green note is removal of the first layer. The most important lesson from the dream for me was the degree to which it is demonstrated that synesthesia is a language, albeit a picture language produced by my body and seen only by me. How else can I explain why it is that I am able to conceive of playing those seams of a dress on a piano? And why else can they function to both provide the sound of cello when I avoid looking at them directly? Perhaps I am fluent in what for other people is a dead language of childhood (though it is anything but dead to me). As my body’s language, it saves me a step in understanding its symbols because I have nothing to learn; I already know what the symbols mean. Thus, were I to use the dress as written music, I could play it more easily than if I were reading classical written music which is a language made up of musical symbols that I had to learn, had to acquire –- symbols that mean nothing to me intuitively unlike the symbols of my own picture language that come with the meaning intact. The lines of the dress require no translation for me. I neither had to learn to read this language nor can I lose this language because it is also my native tongue. I am accustomed to listening to the language of shapes. 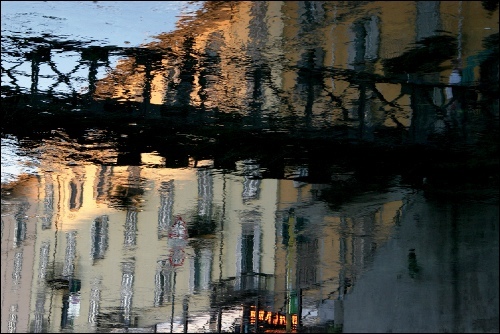 Another example of how my picture language works as personal musical nomenclature is exemplified in the image “Vibrato Bridge” (see image), a reflection that I photographed on the surface of the water of one of the canals in Milan, Italy more than a decade later. The colors I heard the evening that I took this photograph are not specific to any particular musical instrument though the sound is definitely within the lower range or register that is typical of brown in my perceptions. What is specific is the shape of the bridge, which produces the sound of a vibrato. Indeed, for me the shape IS a vibrato both as music I hear and secondarily as a symbol that would indicate I should play a vibrato if I saw it on written music. No one would have to teach me how to interpret this shape it as a musical symbol. Interestingly, if I eliminated the color from the photograph and changed it into a black-and-white image, I would still instantly recognize the shape as a representation for vibrato, but I would not necessarily hear a vibrato because without the color, the shape is only as a symbol for me in this instance. Apparently, the color is required to turn the shape or the symbol into music I can hear just by looking; that is, the color required for the music to be heard in my mind. In addition to sound, I feel texture when I look at the photograph today. I feel my skin draped in a cloth of light brown silk appliquéd with a black lace trim. Another good example of how color and shape elicit sound for me is the photograph named “Homage to Monet” (see image) which I took when I heard a chord of color. 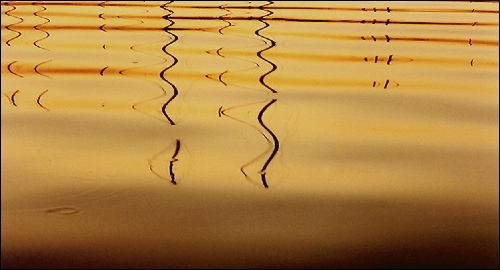 Incidentally, a “chord of color” is not a metaphor for me but quite literally what I saw when I heard the sound by looking at the image on the water. I also heard a crescendo created by the shape of the white arc that goes across the image and I clicked the shutter when I felt the crescendo rise and peak inside of me. The sound of the musical chord is produced by the arrangement of the colors themselves. By the way, I was not thinking of Monet or his famous footbridge painting when I took this image, but afterwards, so many people said that my image reminded them of that famous painting that I felt obliged to name the image after him. What I secretly wonder is whether Monet heard the same sound as I when he painted his image. The image “Layers of Meaning” (see image) perfectly represents what a layered thought looks like to me. The dark shape in front — a shape that is reminiscent of an Asian letter or the lowercase mathematical symbol for Pi — represents the visible to me, while the white shape behind it stands for the second version that I automatically view on the other side of consciousness. Even as I look at the white additional layer, I understand that it is generated from the dark object in front of it, which is the reason that its edges are indistinct and that its shape is amorphous, much like the nature of meaning itself. I have chosen the perfect medium for the role of synesthesia in my art. While I naturally live my life in metaphor, the water provides a mirror for both sides of me; the reflection matches the inner screen that other people cannot see while it also reflects (no pun intended) the qualia of experience which is to me is “the real thing”. Similarly, the water, concentric circles and all, matches my conscious life, the one that is most apparent to others. Reflections are to water as dreams are to conscious awareness. 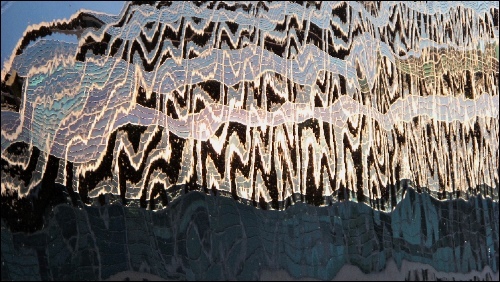 A very recent photograph I took titled “Abstract Blue” (see image) provides an interesting illustration of how my synesthetic self is capable of sometimes slipping out and speaking for me in a picture language that is not meant to be heard by others and not necessarily understood by anyone but me. “Listen?” she said, “you mean it refers to music?” While of course the term could apply to music, that is not at all what I meant, I was referring to how it functions in a narrative stream. “Counterpoint? Music? Color?” she replied. “What do these terms have to do with literature or words?” and she was right to ask. As I later realized, my real problem was that I did not realize I was speaking in metaphor. When I figured out specifically what my problem had been, I felt myself blush in the same way I might blush if I were told my slip had been showing. I felt embarrassed to realize I had been speaking in metaphor without knowing it. I had thought I was simply describing “the facts” but since the facts I was describing were the pictures I saw when they popped up on my internal screen, I was not speaking in facts at all; I was speaking in pictures. It was as if I had forgotten to translate that first response where my inner self throws up pictures on the screen faster than I can come up with words that mean the same thing. The experience did however point out something I had not understood before concerning the role of synesthesia in both my art and in my life. I had accidentally spoken in metaphor because I had forgotten to translate my usual pictures into metaphor-free words but the meaning of my mistake had more important meaning, I realized. For it was not I who was doing the talking at all when I tried to answer her question. It was my usually mute inner self who had stepped forward and spoken up in my place using the dead language of my childhood aloud.